A few miles east of Niland, California, is an area know as the Slabs. 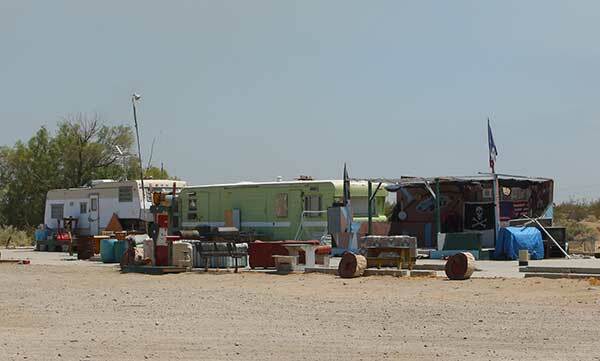 The Slabs have been referred to both as "the last free place on earth" and an "anarchist RV town." The site was the location of Camp Dunlap, a U.S. Marine Corps base activated on October 15, 1942 as a training facility during World War II. Camp Dunlap was used to train the artillery and anti-aircraft units of the Fleet Marine Force. In October 1961, the United States Department of Defense conveyed the land on which Camp Dunlap was situated back to the State of California. Later legislation required that any revenue generated from this property go to the State Teachers’ Retirement System. All of the former buildings at Camp Dunlap were removed. The remaining slabs however, were not removed, and became what is now called Slab City. Squatters and snowbirds have taken up roost at this old, abandoned military base. 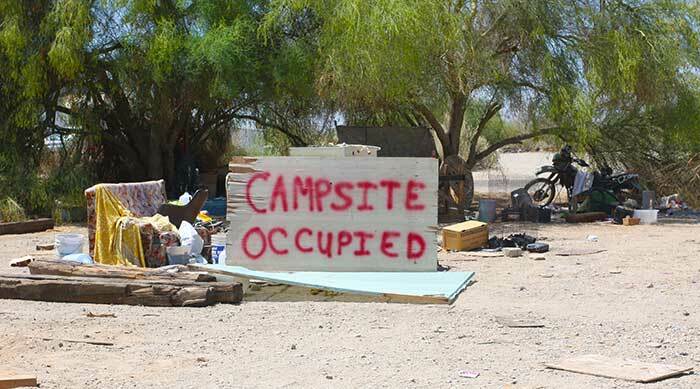 It all started back in 1965, when Riverside County placed limits on the length of time allowed for a campground stay; the BLM had enacted similar rules. There are no rules or fees at the Slabs. The community enacts no laws, and has no running water, power lines, sewage service or trash pickup, giving the place a Mad Max post-apocalyptic look and feel. 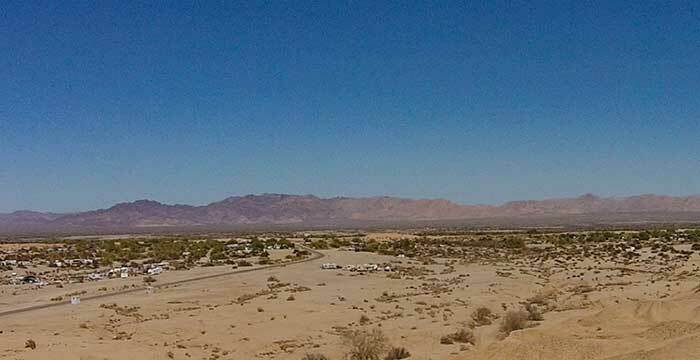 During the winter months, as many as several thousand campers – mostly elderly retirees – flock there for the warm desert weather and the lack of fees. These seasonal residents, known as "snowbirds," live in a variety of housing structures. Though most come to the area in their RVs, many also squat in abandoned structures such as old inoperative buses, driftwood shacks, abandoned water tanks, or any place that provides a little protection from the elements. A small population lives there year-round, braving the harsh summer months when temperatures can reach above 120 degrees Fahrenheit. 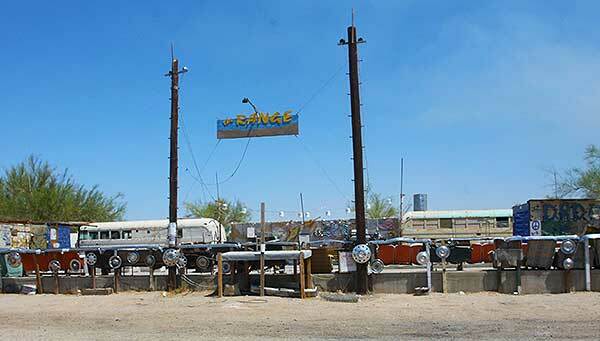 There are many slabs and campsite areas within Slab City. There is even a church and an 18-hole golf course (in the desert, no grass). One woman started the Lizard Library, where you can borrow, donate or trade books and magazines. 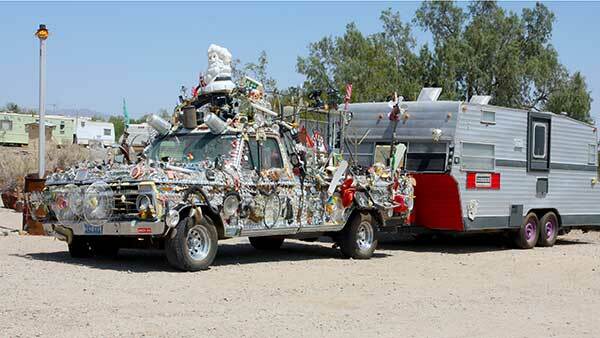 It has grown to fill a couple of makeshift rooms, and it is always open to the residents and campers at Slab City. Another Slabber set up a nightclub called The Range. It is a stage between two old buses. Seats were scrounged from old car, bus and theatre seats. They have open mike night and other scheduled entertainment there. I’ve read that they get some good talent playing there on a regular basis. The freedom of the Slabs has given artists a new area to create with a unique autonomy. Abandoned water tanks and other diverse structures make great canvases, and open areas provide space for artistic fabrications. Of the many works of art there, we found three of particular interest. 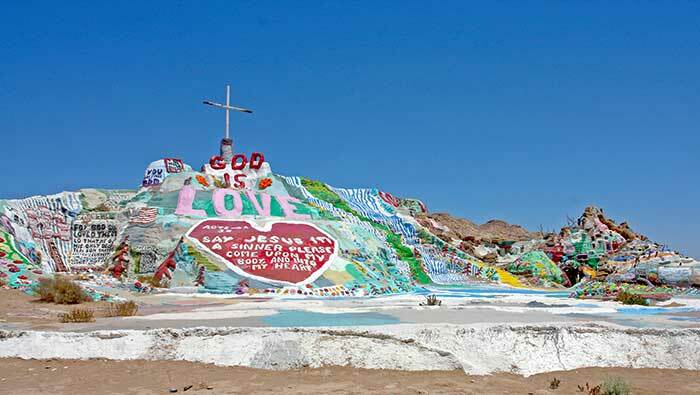 The most popular and probably the most famous slabber and artist was Leonard Knight, the creator of Salvation Mountain. For over twenty-five years, Knight lived out of his truck and worked continually on his colorful art "mountain," which marks the entrance to Slab City. Twenty-five years of hard labor, endless buckets of adobe clay, 100,000+ gallons of paint, thousands of hay bales and one man with unwavering faith were required to build this mountain. 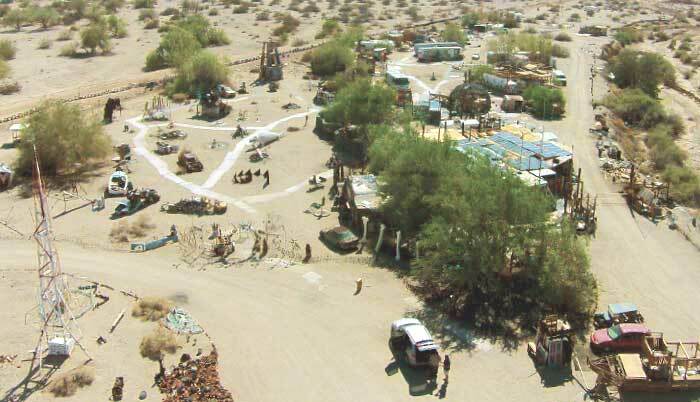 Salvation Mountain has earned the recognition of The Discovery Channel, Ripley’s Believe It or Not and National Geographic. It is not an ordinary mountain and the man who built it was not an ordinary man. Read more on Leonard Knight here. EastJesus.org says that Charlie Russell, the founder of East Jesus, initially came to the area to work alongside Knight, and quickly became enamored with the idea of “The Last Free Place.” In early 2007, Charlie left his tech job, packed all his belongings into a shipping container, and began to surround his two art cars with the sculptures that would become the foundational works of East Jesus. The labyrinthine central complex he constructed houses administrative, operational, and hospitality facilities, as well as containing a musical performance space with a studio grand piano, PA, and stage lighting system. Since Charlie’s passing in 2011, a board of directors has guided the curation and expansion of East Jesus, honoring his vision of a sustainable, habitable, ever-changing art installation. Click here for more photos of the art of East Jesus. DesertUSA visited East Jesus and made a short video on location. The Kinetoscope is a circular mural, painted inside an abandoned water tank, created by Christina Angelina and Ease One. There, Angelina painted two sequences of fantastic, artfully rendered, female faces. The portraits seem captured in frozen moments and combine to create a sense of motion. Her website, christinaangelina.com, states that “Each individual face embodies a specific emotion tied to a meaningful moment when Angelina trusted her intuition, an inherent sense often ignored by society. The subtle interconnectedness of these moments creates a sense of ‘magic’ in its movement as each form contributes to the natural flow of the piece. Her use of totem animals continues through the incorporation of raven and rattlesnake skulls. Faces sit atop a ghostwritten blend of Eastern/Western writing styles by Ease One. These hidden words form the lyrics to Society by Jerry Hannan and Eddie Vedder.” Read more about the Kinetoscope here. A nearby water tank was also painted by Christina Angelina. Christina Angelina has painted many murals in the southwestern desert. More of her work can be seen at East Jesus on a partially buried bus and on the wall of a market in Salton City. DesertUSA visited the sites to make a video showing her art in the desert. Salvation Mountain, East Jesus and the Kinetoscope are all located in Slab City near Niland, CA, USA.